Facts: The 2% payroll tax cut not only boosted workers’ take-home pay by $120 billion in 2011, but it also widened the government’s budget deficit, and left the social security trust fund in the red. Since Social Security and Medicare taxes are collected in order to realize future benefits, why would the federal government choose to refund a portion of those collections today? Are its entitlement programs in such good shape that the government can afford to distribute benefits prematurely? I don’t think so. For that would infer that future benefit payouts are on the decline. However, to the dismay of many, in fiscal year 2011 the net cost of social security benefits increased by 18.9%, over fiscal year 2008, while tax collections declined by 13.5%, widening the breach by 1,678%. Since at least 1975, a growing portion of social welfare spending has been introduced by Congressional tax-writing committees and administered by the Internal Revenue Service. As I outlined in Tax Simplification, Part II, the Earned Income Credit, Child Tax Credit, and Making Work Pay Credit were primarily responsible for IRS administered giveaways of $171 billion in fiscal year 2010, or if you prefer $1.7 trillion over 10 years. In fiscal year 2011 the amount was upped to $231 billion per year, due to the payroll tax cut. And today, some members of Congress are urging others to increase these tax giveaways to $351 billion annually, which I think will end up costing closer to $471 billion (as explained below). But in all of this pandering, what is even more illogical than charging additional debt to Obama’s unlimited credit line, is the rebating of funds “supposedly” earmarked for future liabilities. As Sherlock and I proved in Social Security: A Breach of Trust, the federal government has summarily confiscated and spent every dime of the $2.6 trillion surplus, which would have comprised the Social Security Trust Fund, and has replaced it with non-marketable, special-issue, Treasury securities. And since these special-issue securities are an asset to the Trust Fund and a liability to the U.S. Treasury, they therefore cancel each other out. In other words, since there is no surplus, every dime of Social Security and Medicare tax collected today is spent today, therefore any shortfall rests squarely on the shoulders of the general budget. And as you may know, the general budget is currently more than $15 trillion in arrears. When the Making Work Pay Credit expired at the end of 2010, it was replaced with the 2% Payroll Tax Cut, as part of the Tax Relief, Unemployment Insurance Reauthorization and Job Creation Act of 2010. The newest tax gimmick allowed a 2% cut in payroll taxes for employees, which reduced the Social Security Tax from 6.2% to 4.2%, without affecting Social Security benefits. 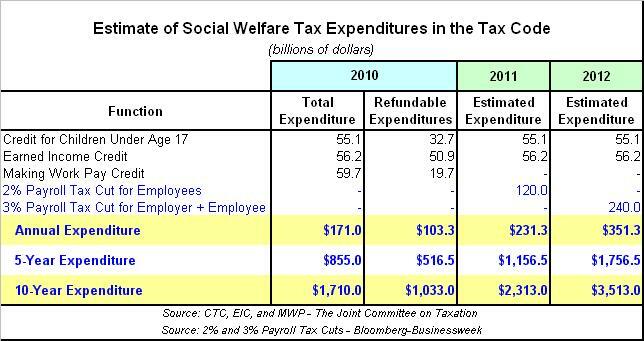 But in the big picture, all it really accomplished was to elevate the amount of social welfare tax expenditures already in the tax code, from $171 billion in 2010, to $231 billion in 2011, or by another $60 billion (see table below). So in other words, Bloomberg-Businessweek thinks that annual social welfare tax expenditures of $171 billion in 2010, and $231.3 billion in 2011 were not enough. According to the editor’s, social welfare tax expenditures should be increased to $351.3 billion, and conservatives should be willing to go along, to get along. But stepping back from the easel, to gain some aesthetic distance, the inference appears to be that a 10-year tax expenditure of $1,710 billion wasn’t enough, that $2,313 billion is insufficient, and that $3,513 billion is somehow the magic number (assuming that expenditures for the child tax credit and earned income credit remain fixed). I don’t know any true Conservative, in my neck of the woods, which would go along with blowing a bigger hole in the federal budget than already exists, for any reason; especially not to extend another temporary economic stimulus, some 29 months after the recession officially ended. These days, it’s as if every time a temporary measure expires, its reversal is deemed to be a tax hike. But the expiration of this one-year, one-time, re-election ploy isn’t a tax hike at all; it’s merely the death of what was probably a bad idea in the first place. If we follow the logic that every temporary measure is permanent, then Obama’s entire 2009 stimulus spending binge must represent the new normal, and any reduction in government spending must be deemed a deviation from the norm, and thus a bad thing. But if not a descent towards Greece, where will this road end? Italy? France? Sheol? I am not sure how the editor’s of Bloomberg-Businessweek arrived at their $120 billion and $240 billion figures, but let’s assume the former is correct. If so, then it would seem to me that since the cost of the 2% tax cut was estimated to have been $120 billion, that upping the employee payroll tax cut from 2% to 3%, and adding an employer tax cut of 3%, would come to more than double the current giveaway. Simple math leads me to a price tag closer to $360 billion [(120 / .02) * .06], than $240 billion. And that doesn’t include adding the 6.2% tax cut on new hires and pay raises, which would up the ante even more. Other than that little boo-boo, the major omission from Bloomberg-Businessweek’s one-sided endorsement of Barack Obama, because that’s what it is, is that any cut in the Social Security payroll tax translates directly into an increase in the budget deficit, and by extension, the national debt. The total amount of tax revenues collected dropped from $671.2 billion in fiscal year 2008, to $580.9 billion in fiscal year 2011, or by $90.3 billion. And the total cost of operations jumped to $782.7 billion in fiscal year 2011, from $658.4 billion in fiscal year 2008, or by $124.3 billion. In a nutshell, the fiscal year 2008 annual surplus of $12.8 billion has been transformed into a $201.8 billion annual deficit in just three fiscal years. In fact, expenditures have exceeded revenues by $370.9 billion over the past three fiscal years. In other words, social security tax revenues have fallen by 13.5%, since 2008, while operating costs have risen by 18.9%. Another way of stating this is that the shortfall in Social Security tax collections, versus expenditures, has widened by 1,678%. This is significant because any shortfall, whether covered by interest on the debt or appropriations, must be siphoned directly from the general budget. In effect, these annual deficits have increased the national debt, while simultaneously compromising the future of our troubled entitlement programs. Following the wisdom of Bloomberg-Businessweek, and implementing this fraction of Obama’s misnamed American Jobs Act, would add another $120 to $240 billion to what is already a $201.8 billion deficit on the Social Security Administration’s account. The idea of a payroll tax cut is not a bad one in and of itself, for a nation where the net cost of social benefits is on the decline, however under the circumstances, which some of us refer to as reality, it is probably the dumbest idea proffered by the Obama Administration to-date (although that’s pretty much a tossup). Personally, I can do without the 2% payroll tax cut, since it has done nothing to increase my personal consumption, has accelerated the national debt, and has compromised the future of Social Security. No. I’m not on the band wagon with those harping for more social insurance rebates. Nor am I opposed to a surtax on those making more than $1 million per year, as long as it’s accompanied by a greater amount in spending cuts. What good is an equal increase in both spending and taxes? And what government-manufactured problem would a tax cut for some, and a tax hike on others solve? I say, ‘no good’, and ‘none’. As far as I’m concerned, anyone who votes for either keeping or increasing the payroll tax cut, under any circumstance, short of a 10-fold cut in spending, is an idiot. And anyone against raising taxes on taxable incomes greater than $1 million per year, in exchange for a 10-fold reduction in spending, is devoid of common sense.